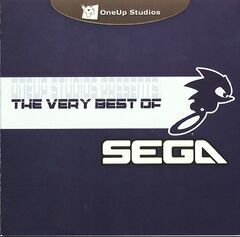 The Very Best of Sega is an unofficial album featuring cover versions of tracks from various Sega games. The album is performed by Ailsean, Esther Stilwell, Mustin & The Extra Men and Broderick Daniels; and arranged by Mustin, Kaijin, Dale North, William Reyes and Ailsean. The album was available to buy for download on SnoCap via the OneUp Studios website, with an additional three tracks which were downloadable for free. The site has since moved and the album is no longer available there. The album was also previously available on Bandcamp. It has also been made available on iTunes and Amazon, with individual tracks costing US$0.99 (US$0.89 on Amazon), £0.79, €0.99 or ¥200. In 2014 the digital versions were rereleased on iTunes and Amazon with different cover art and under the artist name Bad Dudes.